Save Your Stones is a company located in western Wisconsin owned by Jarrod Roll. Roll, Director of the Monroe County Local History Room & Museum in Sparta, WI, has been actively helping people properly clean gravestones since 2006. 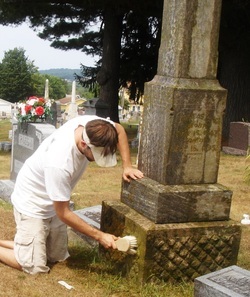 He and his team have been cleaning gravestones in western Wisconsin for several years and are the creators of the Gravestone Cleaning Kit for those who wish to clean the gravestones themselves (or live too far away to hire him to do it!). All cleaning methods and materials used by Save Your Stones to clean gravestones and sold as part of the kit are approved by stone conservators. Jarrod goes through the steps he takes to clean a basic gravestone. NOTE: The segment did not show him using D/2 Biological Solution at the end of the cleaning process, but the news anchor does mention it at the conclusion of the segment. When our ancestors laid carved stones to mark the graves of loved ones, they likely thought the stones would last forever. But time and the elements have eroded away the stones, leaving just a hint of the original markings. While little can be done to undo the damage, proper cleaning can help stop further deterioration. And taking a quality photo of the words and markings on the stone can preserve the history it holds, says Jarrod Roll, who along with his wife, Heather, operates Save Your Stones. Jarrod Roll, of Onalaska, Wis., also is Monroe County historian and director of the Monroe County Local History Room and Museum in Sparta, Wis. 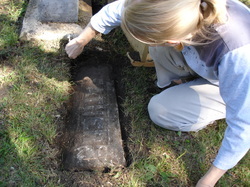 Through his work, Roll became acquainted with Ralph Hendersin of Sparta, who has done extensive work in educating the public how to care for aged or damaged gravestones. When Hendersin hosted a workshop for area cemetery caretakers on how to care for stones, an overflow crowd showed up and learned how to care for the stones, but few of the caretakers showed an interest in doing the work, Roll said. As time went on, Roll said, he had more people seek help in caring for the stones, but few wanted to do the work themselves. Most wanted to hire someone to do the job. That, he said, was when the idea of starting a side business came up. Through his work with Save Your Stones, Roll said, he is able to provide a service for people who want to care for loved ones’ stones and to preserve history at the same time. Because birth and death records were poorly kept until the early 1900s, Roll said, gravestones often are the only way to reliably document vital genealogical information. But many times the stones included additional details about a person’s life that are being lost the longer the stone is left to deteriorate, Roll said. Save Your Stones serves cemeteries in La Crosse and Monroe counties, at a cost of $50 for one stone and $25 for each additional stone in the same cemetery, Roll said. Roll starts each job by taking digital photos of the stone. He and Heather then thoroughly clean the stone and take additional photographs. They then give the customer a print of the final product and send along digital copies of the photos that show the stone and its surroundings. This not only shows the customer the final product but also documents what is on the stone. To preserve this important information, Roll takes photos of the stone from various angles. These photos are designed to show what is left on the stone for family records, but it also could be used to regrind the stone or to produce a replica if the family wishes, he said. Roll said the cleaning techniques he uses are the best way to clean the stone without doing additional damage. “There’s a fast way, there’s a simple way and there’s the right way,” Roll said. Some businesses use acid-based power washers to clean the stones. While that may remove the dirt and grime, it also takes away layers of the stone, which could cause long-term damage. “We want to do what we can to make sure people use the right technique to clean the stone, even if they don’t hire us,” Roll said.